Every organization is under immense pressures to digitize and automate all aspects of their operations, yet many still rely on manual tasks for vital business processes, such as collecting, reviewing, and inputting information between systems, websites and portals. Repetitive, remedial tasks require your employees to log in and out of multiple systems, copying and pasting data between different sources and formats—slowing productivity and creating operational inefficiencies. 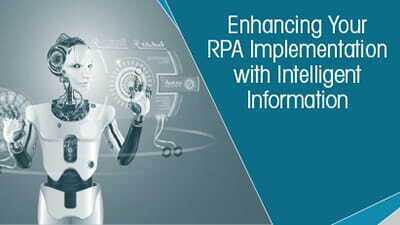 Kofax RPA (robotic process automation) is the fastest and most efficient way for you to acquire, enhance and deliver information from virtually any application or data source—including websites, portals, desktop applications and enterprise systems—without any coding. 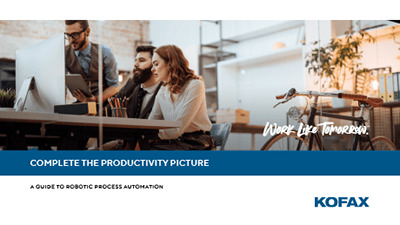 Create a digital workforce that works side-by-side with your employees to drive greater efficiency and eliminate almost any manual data-driven activity. Now information that was previously unattainable, unusable or time-consuming to collect and process is readily available to increase productivity, improve decision making and deliver a better customer experience. Return time to a busy workforce and free your employees from repetitive, manual tasks so they can apply their skills to value-added activities that require a human touch. Software robots automate the interactions that a user performs within an application or other data source, allowing your workers to focus on more strategic work while increasing productivity. Automatically acquire and integrate data from websites, portals, and enterprise applications for streamlined processing of digital content and greater insight for decision making. All types of application environments are supported, including web, windows mainframe, windows, JAVA, and mainframe. Deploy software robots to new process activities as your business needs and priorities change without the need for coding and months of development. Build and deploy automation in a matter of days and weeks—without ripping out platforms that are core to your business or re-engineering processes. See how Kofax RPA can help solve problems for your business.